Sure college is a time to mature, but that doesn't mean you can't have dorm items with fun, festive prints! In fact, add festive prints as much as you want to your dorm room! It won't feel like a home away from home if you don't! 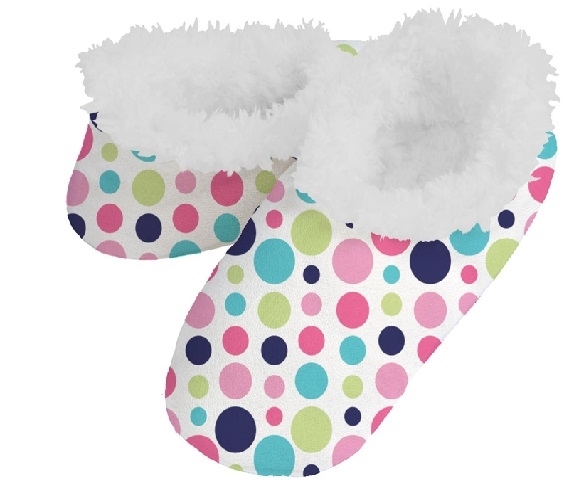 While you're adding festive, fun designs to your dorm bedding and dorm rug, add more festive designs to your feet with our Bubble Dot Dorm Snoozies! Dorm Snoozies are a dorm essential to keep next to your dorm bed at all times to avoid the cold, hard dorm room floor. Trust us, you don't want to step on cold dorm linoleum after being super warm in your comfy dorm bedding all night! Our Bubble Dot Dorm Snoozies will keep your feet super warm and comfy when you wake up in the morning and are great to put on and relax in after a long stressful day of college courses. Made with a brushed fleece exterior and soft Sherpa fleece interior, your feet will feel so warm and cozy it will be like you never left your dorm bedding! Our Bubble Dot Dorm Snoozies also have a non-skid sole so that when you're doing laundry in the dorm laundry room or hanging out with friends in the common room, you won't have to worry about the soft fabric making you slip and fall.